I recently tried my hand at making body butter for the first time and I wanted to share the recipe so you can try it yourself too! 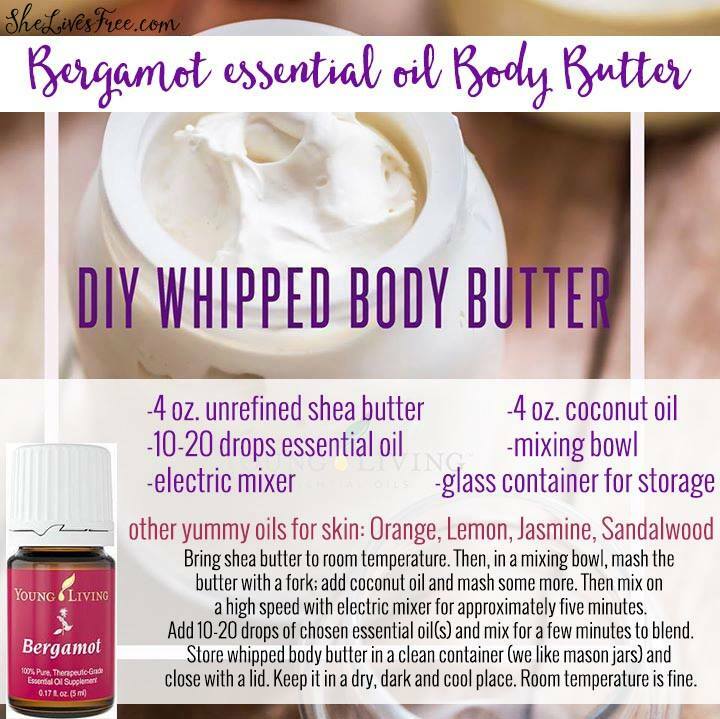 The oils in this recipe are all naturally moisturizing and uplifting, so it feels and smells like a luxurious spa treatment every time you apply this sumptuous body butter. My dry skin is finally happy! I used 4 ounces each of the coconut oil and shea butter and 20 drops of essential oil, but you can easily double or triple this recipe to make more. In a small saucepan, melt the oils together over low heat. Carefully pour the liquid oil into a chilled bowl, mix in 10-20 drops of essential oil, (I used Bergamot but you can use whichever oil you prefer), and allow to sit until the oil begins to harden. You can throw the bowl in the fridge if you want to speed up the process, but be careful not to let it get too hard! You want the oil to be firm, but not solid, for the next step (about the consistency of softened butter). When the oil is ready, whip with a mixer for several minutes until the body butter is fluffy and the volume has increased. Grab some pretty labels and a clear glass jar and you have the perfect gift for yourself or others! This recipe makes just over a cup of body butter, so it fits perfectly into one of these short little mason jars. Package it with a cute bow, and you have an easy peasy DIY holiday gift that’s ready for giving! Each of these oils have so many other uses too! For more creative ideas on how to use essential oils, check out our free Facebook group for learning everything you could want to know about essential oils about your own pace: Enjoy Life with Young Living essential oils group. We also have a 12 Days of Christmas Facebook event happening November 13th – November 24th full of easy DIY gift ideas to make with essential oils – all are welcome! This sounds great… and I would love to try in a citrus smell! This looks pretty simple – thanks for sharing! Do you use liquid or solid coconut oil for this recipe? Sybil Brun recently posted…Have Oils, Will Travel! Hi Bee! Should be several years unless stored in the sun, then it may break down faster.